They have been outlawed and hunted to the brink of extinction. The Diaspora, once devoted to peace and diversity, has become the Utopia, dedicated to war, subjugation and destruction. However, a rag tag band of rebels will ignite a revolution that will bring justice to a galaxy. 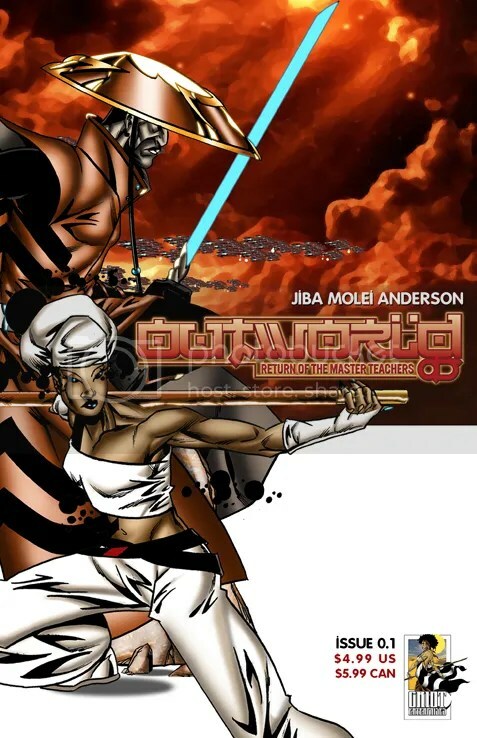 This is from writer/creator/artist Jiba Molei Anderson, who also created the two HORSEMEN graphic novels, which I’ve previously written about in my post: 13 Comics To Read in 2013- Chacebook Edition. So when I heard about this new series he was starting, a space opera fantasy, I just had to cop this. This 28 page (24 pages of story), full-color book takes place in a Galaxy far, far away, The Utopian Collective is an interplanetary federation of multiple alien civilizations, that claims to be peaceful but is more akin to a dictatorship or police state. On the surface, everything is orderly, but underneath it we see examples of occupation and slavery, as less advanced cultures are forcefully assimilated into the Collective “for their own good.” We get some glimpses into it’s history, as an powerful alien race called the Fudo swept through the Galaxy enslaving many other races. Then a band of ex-slaves rose up, and fought their masters, becoming known as the Orijah. The Orijah’s apprentices, known as the Master Teachers, continued the cause and fought back against their oppressors, leading to a new peaceful government, known as the Diaspora. But over the years, in exchange for security, the peaceful government became more totalitarian, leading to the Utopian Collective of today (it’s an interesting play on words, where the Diaspora was good but the Utopia is bad). So now a new group of Master Teachers has risen up to fight back. This is issue is available right now as a digital download via DriveThruComics.com, and is due to be made available in print and digitally through IndyPlanetComics.com this Wednesday, June 5th.